You’re paying too much for the doctor. We can help. Just tell us where you are, what kind of care you need, and what time works for you. Best of all? You name the price and we’ll match you with a nearby doctor. Healthcare is in your hands now. *Promo code KAMIN25 can only be used on appointments $50 or more. Prices listed above reflect prices before promo code is applied. For this issue of Kāmin Sense Magazine, we had the privilege to interview Dr. David H. Berman, a medical doctor who has been in practice for over 30 years. Together with his two sons and a team of more than 35 people, he is utilizing technology to change the healthcare world for both medical providers and patients. 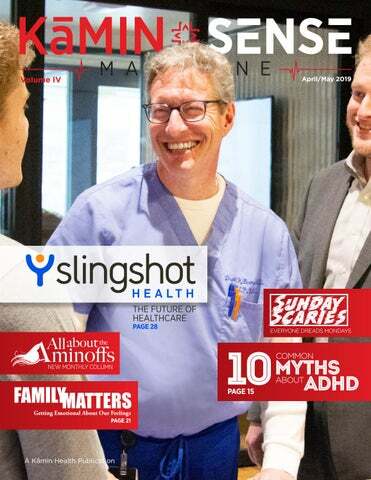 Slingshot Health has developed a two-sided marketplace for healthcare that has been really knocking it out of the park, and they are just getting started. Find out more on page 28. As always, Kāmin Health is dedicated to ensuring that each and every one of our patients receives the appropriate care and attention that he/she needs and deserves. The Kāmin Sense Magazine was created to take our vision one step further by providing quality content for our patients to enjoy, both in our clinics and at home. This publication aims to bring you material that is directly related to the world we live in today. I encourage you to follow these columns and reach out to our contributors who are available for questions and comments. They bring with them years of experience and are more than happy to share their knowledge with you. I would also like to hear from you. Feel free to reach out to me via email at editor@kaminsense.com if you have any questions or ideas that you would like to discuss. I look forward to hearing from you. www.KAMINSENSE.com Kāmin Sense Magazine. Published by Kāmin Health Urgent Cares. All rights reserved. Reproduction in whole or in part in any form without prior written permission from the publisher is prohibited. The publisher reserves the right to edit all articles for clarity, space, and editorial sensitivities. Kāmin Sense Magazine assumes no responsibility for the content of articles or advertisements in the publication, nor for the contents of books that are referred to or excerpted herein. Kāmin Health Directory Find a location near you! Kid's Korner Fun & games for the kids! 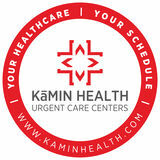 About Kāmin Health Perhaps the formula for your standard, city type, 3 per block Urgent Care Center can be found online. Buy this, order that, add a flashy sign and you are done. What’s lacking is the passion. What’s lacking is the care and creativity without compromise. What’s lacking is the desire to be the absolute best and provide those in medical need superior healthcare in a warm, inviting and calm atmosphere. What’s lacking is Kāmin Health! After decades in the Healthcare industry, the founders of Kāmin Health decided to make Urgent Care their next endeavor. Not viewing this venture as just another group of Urgent Care Centers, they decided to add many elements from their second business in Hospitality and merge almost a century of collective experience into the “Kāmin Health experience.” Who is to say that only a 5-Star Hotel can provide beverage services consisting of fresh gourmet coffee, specialty teas and ice cold beverages? Why are posh and inviting colors and award-winning designs reserved only for Resorts and Country Clubs? Aside from providing the very best in medical equipment together with the most dedicated and caring medical and professional staff, we at Kāmin Health, we have broken these boundaries. Large flat panel displays in every room, free high-speed Wi-Fi and charging stations for your April/May 2019 - Volume IV - Double Issue tablets and phones are not a list of luxury room amenities – rather standard comforts in a Kāmin Health Urgent Care Center. MEASLES ALERT The hottest topic on the New York medical landscape since our last issue of Kāmin Sense Magazine is the measles outbreak. The Department of Health has been scrambling to issue all types of rules and regulations in order to contain, and once again eradicate, this terrible disease. As a medical professional, I would like to advise you as to how important it is to speak to your doctor to educate yourself about vaccinations, and to keep all of the risks of not vaccinating in mind when making your decision. It goes without saying that if you or your children have been exposed to the measles or display any of the signs and symptoms listed below, you should immediately seek medical attention as the disease can be deadly. Measles symptoms don't appear until ten to 14 days after exposure. Measles starts with fever, a runny nose, a cough, red eyes, and a sore throat, followed by a rash that spreads over the body. Measles is highly contagious and is spread through coughing and sneezing. All Kāmin Health Urgent Care facilities are ready and able to see you for your titers (a check of your disease immunity) and MMR booster shots—assuming you meet all the criteria for eligibility— so you can make sure you and your family are protected. Allow me to remind you that Kāmin Health Urgent Care Centers are open seven days a week with extended hours to accommodate your schedule. As we like to say, “Your healthcare, your schedule.” If you have any questions, feel free reach out to me at DrK@KaminSense.com. Personalized protection Coverage that’s catered to you. Your protection needs are unique. Shouldn't your insurance coverage be just as well? I am committed to learning what you need. And, just as important, what you don't. Call me or stop by to get a quote today. Subject to terms, conditions and availability. Allstate Fire and Casualty Insurance Co., Northbrook, IL © 2019 Allstate Insurance Co. Contact me for personalized advice you can trust. Take a look at this if you want a good laugh,” my colleague said as he thrust his phone in front of my face. Playing on the screen was a YouTube clip of an Italian comedian named Sebastian talking about his first exposure to the Jewish holiday of Passover. He described how he was invited to Passover dinner at a friend’s home. Upon arrival, he sat down to enjoy what he assumed would be a delicious dinner only to be handed a pamphlet to read. And that’s when he found out that Passover dinner would be served only after the reading of the booklet—out loud, no less—in about two hours. When dinnertime finally arrived, he had a crash course about Passover dietary restrictions (no bread or pasta, which was certainly not to the liking of an Italian patriot) and had about enough when he saw the first course—a slice of kosher for Passover gefilte fish. He summarized by saying that tradition is great, but if you’re going to invite him for Passover, he’s doing the cooking! LIFESTYLE CHANGES While you smile at the thought of an Italian chef/ comedian doing your holiday cooking, it might be a good time to analyze the holiday of Passover from a different perspective. The Passover holiday is about celebrating freedom and heritage together with family and friends. It wasn’t easy to remove steak from my diet, but I had to know if it was contributing to the problem. I experimented by cutting red meat out of my diet and eating fish as my protein source. With my newfound commitment to eating right, I found that not only did I feel better, but my quality of life improved. I had more energy, and it was a different kind of energy. This healthy energy was not fueled by Red Bulls and sugar. By staying committed to the cause, not only did I lose weight, but I felt great too. Recently I travelled to Jerusalem. I was a guest in someone’s home for a meal, and when I declined the proffered meat dish, my host challenged me. After a short debate where I expounded on how much better I was feeling now that I was consuming a meatless diet, he informed me that he had also removed meat from his diet at one point. However after some research, he concluded that small amounts of meat are beneficial and cautioned me that cutting meat out completely wasn't as wise as I thought. The most difficult part about any life change is to actually make the change. BREAKFAST: Red Bull or coffee. LUNCH: Whatever I could get on the road, most often a snack or occasionally a slice of pizza or a wrap. DINNER: Steak in a restaurant with clients or friends. SNACKS: Plenty! It’s no wonder I wasn’t feeling my best. Simply cutting out water, while beneficial, wasn’t going to cut it. I began experimenting with my diet. While the debate about red meat is ongoing, consider eating chicken and turkey as proteins. If you can focus on the fact that your life will get better once you start eating healthier, you will feel motivated to make a change. is more common today than ever before, but there are still many unknowns. Recent studies indicate that some people are genetically prone to addiction, which explains why someone may be more likely to become an alcoholic. No matter how you slice it, most people who start using substances are doing so either for social or coping reasons and often to fill some kind of void or block out pain. Similarly, food can be comforting and people get attached to it. The drug or food serves as a “fix” to soothe the person who is struggling. I asked Mendi what advice he could offer someone seeking the confidence to take action. “The challenge is generally in perspective,” Mendi responded. Often, an individual may be worried about the stigma involved and this holds him back from seeking help. In certain communities, people worry about the way they may be viewed by others if an addiction in the family becomes public knowledge. “Accepting that addiction is a disease and not a moral issue is making it a lot easier for people to seek help,” continued Mendi. “Simply put, we should view eating disorders and food addiction like a disease of mind and body; a health issue.” He stressed, “It is no longer necessary to rely on handouts from people to cover the astronomical costs of rehab out of pocket. There is no need to bankrupt the community for issues that insurance covers.” With this statement, Mendi raised an important point. In the past, those struggling with addiction would often have to turn to family or friends to help raise money for treatment. Today, that may not be the case as more insurance companies are covering the costs of rehab. now is a good time to make a great plan. The changing of seasons is an optimal time to pause and reflect internally. Ask yourself: What are my goals for the coming months? What do I want to achieve over the summer? Where do I want to be in one year? This year, add a new question into the mix: Are there foods that are draining my energy and preventing me from achieving my goals? Mentally preparing yourself to avoid certain unhealthy foods is the first step to actually doing so. Once you take that first step, you can be on your way to achieving true success. Ask yourself: What are my goals for the coming months? As someone who has embarked on a journey to better health, I have some practical advice for you. Don’t take on too much at once: Start small. If you enjoy cake, cookies, sweets and dessert, make the commitment to treat yourself only once a week and to cut out daily snacking. Feeling hungry after dinner? Try having a fruit for dessert. Stick to water: This is a change that you can make immediately. Cutting out sugary drinks and replacing them with water will instantly change how you feel. If you think you’re in the clear because you only drink diet soda, think again. The fact that diet soda is healthy is a misconception. It may be difficult, but the reward is worth it. If there's anything truly worth working hard for, it's your health. Let us apply the lesson we learn from the Passover holiday to make our lives better: Ultimate freedom results from true self-control. here is a story circulating about a boy who was misbehaving in school. His mother took him to a psychiatrist who prescribed ADHD (Attention-Deficit/Hyperactivity Disorder) medication. The boy hated taking pills so he resisted, but his mother was adamant. After two weeks of giving her son the meds, the principal called the boy’s mom to give her feedback. It turned out that since starting the medication, her child was doing remarkably well in class, and his improved behavior had even had a positive impact on the rest of the kids. The mother was astounded, and she asked her son about the turnaround. He told her that the pills were great and were making a big difference in his school experience. She asked her son how he overcame his opposition to swallowing pills. The boy gave his mother a puzzled look and responded, “Swallow them? I would never do that. Every day, I go to the teacher’s lounge, make a coffee, mix the pills into it, and give it to my teacher. It’s really making a big difference. Thanks, Mom!” While this likely fictional story is good for a chuckle, it also highlights how ADHD can be misdiagnosed or misunderstood in various situations. It is important to clarify these misconceptions so we can effectively help our children (and often ourselves) manage the condition. ADHD is a childhood disorder When you think of ADHD, you probably imagine a child jumping up and down in school or spacing out and looking out of the window in the classroom. However, ADHD is relatively common in adults as well as children. Instead of the hyperactive and disruptive symptoms that are seen in younger children, adults with ADHD often present with difficulties in organization, planning, delaying gratification, following directions, concentration, and completing tasks in a timely manner. It has been estimated that nearly four to five percent of adults in the United States have ADHD, but few adults are ever evaluated or diagnosed. If a child cannot focus they probably have ADHD As a neuropsychologist who specializes in understanding a child’s pattern of strengths and weaknesses, I find this myth frustrating. Difficulties in concentration and focusing can come from many sources; ADHD is only one fish in that large pool. Problems with sleeping, eating, vision, hearing, learning, sensory input, emotional well-being, and medical issues are all capable of causing a child to be inattentive or hyperactive. This is why it is critically important for a child who is struggling with attention or behavioral problems to be evaluated by a trained professional before a diagnosis is assumed. The only way to manage ADHD is with medication Although research has shown medication to be effective in managing some symptoms of ADHD, the best treatment option is often a mix of medication and environmental changes. Altering the classroom or home setup, behavior modification plans, regular exercise, and maintaining a proper diet are a few of the non-medication factors that can greatly influence a child’s ability to function with ADHD. Parents are often to blame for a child who has ADHD This myth can be heartbreaking. Many parents believe they have caused their child to have behavioral or attentional difficulties and find it difficult to forgive themselves. In truth, symptoms of ADHD are not caused by bad parenting and are not a sign of family discord. Managing and helping a child with ADHD requires an enhanced skill set that almost all parents do not have inherently, and it often takes years to learn the techniques necessary to properly help a child. Working with a trained behavior specialist, such as a Board Certified Behavior Analyst (BCBA), to master these skills can have a major impact on the lives of the child, the parent, and the family as a whole. There are just as many children with ADHD as there have always been ADHD is one of the most common diagnoses given to school-age children, especially boys. According to a recent study, rates of ADHD in children ages four to 17 have risen from six percent of all children in 1997 to over ten percent in 2016, with boys carrying a prevalence of nearly 14 percent and girls at six percent. In the United States, there are currently over 5.4 million children who have been diagnosed with the condition. Many researchers point to improvements in awareness and support that have helped professionals identify more children who present with ADHD symptoms, although a clear explanation for the increase in prevalence is still elusive. Children with ADHD are always spaced out Although there are many cases of children with ADHD who appear to be unable to pay attention, this is usually related to the material they are learning or how it is being taught rather than an inability to focus on anything. According to Dr. Russel Barkley, one of the foremost researchers and experts on ADHD, the ADHD condition can be understood as a difficulty with regulation and impulsivity. When the environment has stimuli that create an impulse to shift attention, it is difficulty for a child with ADHD to ignore those distractions. However, when the environment provides immediate rewards for maintaining attention, such as you find in a video game, even children with ADHD are often able to pay attention. One way of understanding this is that children with ADHD need more external motivation with immediate feedback to pay attention than other children do, but this motivation is hard to find in an everyday classroom or work environment. ADHD is a behavioral disorder and emotional problems are unrelated One symptom that all parents and teachers of children with ADHD are very familiar with is meltdowns. Children with ADHD are at a greater risk of having emotional outbursts or shutting down, and this correlation is related to the general difficulty that children with ADHD have in regulating themselves. Children with ADHD often have difficulty “cooling down” their emotions. When they are excited, they are often overly enthusiastic, and when they are frustrated or upset, they can become very angry and are unable to calm themselves. ADHD medication is relatively new and has not been studied as much as other medications The usage of stimulants for ADHD treatment has been studied for over 80 years, with studies dating back to the 1930s. Although there are many different types of medication used in the treatment of ADHD, many of the newer medications have the same medicinal component as previously studied versions but are packaged differently (e.g., patches and extended release tablets). As with every medication, ADHD medications have side effects and new research is always coming out as to their specifics. It is important to consult with a pediatric psychiatrist when considering medication for children with ADHD. ADHD has as many positives as it does negatives This is a somewhat controversial point as some people with ADHD do seem to benefit from the disorder. They can be more spontaneous, are able to get involved in many pursuits and have high energy. However, taken as a whole, the difficulty with focusing, controlling impulses, planning and organizing, tolerating frustration and achieving long-term goals usually outweighs any benefit associated with the condition. Increasing our understanding of ADHD with its various presentation types, symptoms and treatment factors can greatly improve our ability to help our children maximize their strengths and reach their potential. It may even help us manage some of our own struggles, even without a little boost in our morning coffee! I am due soon with my first child. I have heard about the importance of skin-to-skin contact with the newborn baby right after birth. Is it really that crucial? Love your column BTW! N.D.
senses. Baby, now calmer and more alert, begins to look around. He/she hears its mom’s familiar heartbeat, learns to recognize mom’s voice, which is no longer muffled, learns to recognize mom’s touch, smell, and taste, all while safely tucked on mom’s chest. The newborn feels safe and calm as it learns who its mom is. Generally, most moms experience skin-to-skin contact with their newborns for one to two hours after birth, and during that time breastfeeding is encouraged. This special time allows the newborn to recognize mom as its food source through taste and smell. At the same time, the contact stimulates mom’s hormones that prepare her body to supply baby with all the nourishment that it needs. Skin-to-skin helps promote breastfeeding, which is the healthiest way to feed your newborn. Most moms recall skin-to-skin bonding time with their newborns as very special and meaningful. You might be wondering where dad is in all of this. I very much encourage skin-to-skin contact with dad, too! When mom is finished with her skin-to-skin time, before your newborn is taken to the nursery, I encourage dad to do the same. Dad can take off his shirt or roll up his sleeves to enjoy this bonding and learning time. Baby learns to associate dad’s touch with his voice and with his skin. Although dad is not a food source and he feels different than mom, he is safe and loving. Dads should take at least a half hour for their newborns to learn about them. Hold the baby on your chest and let the baby learn to recognize your heartbeat, your smell, and your touch. Sometimes if mom needs a c-section, dad can fill in for mom until she is allowed to hold her baby. Dad can do skin-to-skin for as long as the doctor allows, and he and his newborn will learn all about each other. He too can provide warmth and gently welcome his baby into this world. As soon as mom is allowed to hold her newborn, skin-to-skin contact should be encouraged. So my answer is yes! Skin-to-skin right after birth really is that important. Good luck! Sheri Platovsky Sheri Platovsky is a Lamaze Certified Childbirth Educator and Certified Doula. She has delivered over 600 babies in the New York area. Sheri Platovsky has an outstanding reputation from both her clients and the doctors that she works with in many different hospitals, for being intelligent, knowledgeable, professional, caring, sensitive, fast, helpful, and a pleasure to work with. family. She finds my mother unbearable. She may love me the same even if she canâ&#x20AC;&#x2122;t put up with my mother, though it may be difficult for me.â&#x20AC;? However, emotions are like a restless horse in a barn. If the horse starts whinnying and you catch it soon enough and soothe it, you might be able to keep it from breaking down the barn door. But once the horse charges out of the barn at full gallop, it is going to be hard to stop it. Emotions are best anticipated in advance. Once a person sees red, it is much harder to control. dictator and tell everyone to "shut up", because the people may have worthwhile ideas that should be heard even if they are unpopular. And secondly, if the people are not listened to they may either revolt openly, or engage in a work slow down, or perform acts of sabotage. The healthy leader runs the meeting with a firm but compassionate hand. He gives each voice an opportunity to be heard, but also is not paralyzed by indecision, and when there has been enough discussion, or as needed in a moment of crisis, he will issue a ruling without seeking total consensus. Since the townsfolk feel they have an outlet to express their ideas, and they feel respected by the leader, they fall in line and obey. Within the human personality exists a structure known as the Ego. The Ego is the center of self that moderates between inner and outer needs and realities. A healthy Ego serves the same role as the ideal leader of the town hall meeting. The Ego is able to accept and "listen to" the many voices, feelings and impulses bouncing around in our heads, but also is able to keep them under control. The healthy Ego functions as a compassionate but strong leader, and not as a tyrant. As infants and toddlers, we learn from our experiences the need to modulate and control our feelings and impulses. We internalize our Ego based on behavior we have seen in our parents, teachers and other role models, as well as our experience. A person with harsh or overbearing parents might internalize a harsh and overbearing Ego. A person with disorganized parents might internalize a loose and insecure Ego. On the other hand, sometimes people develop paradoxical reactions to their upbringing. For example, someone who grew up in a chaotic home may, as a defense, overcompensate and develop an Ego that is rigid and inflexible. Or, someone who grew up in a strict and controlling home may develop a rebellious nature, and therefore have a weakened Ego with poor impulse control. Looking forward to serving your family soon! The good news is that people can change. On a practical level, what does all this mean? A healthy Ego is not too rigid, but still able to control. Such a person will be confident, but also creative and flexible. The Ego's role is to manage our inner impulses and feelings and allow us to function and manage in the real world. This mediation process sometimes relies on certain fictions and defenses, which are at times functional and at times, dysfunctional. The value of being able to label and recognize these defenses is that they give us a tool for understanding our behavior, especially when we have feelings that may be important but not precisely rational or logical. Grieving, anger, jealousy, and fear are all important emotions when taken in a broader context. At times, it is wise to use these feelings to compel us into action, at other times however, it is wiser to note the feelings but not act on them right away or at all. This is the difference between mental health and impulsive dysfunction. Okay, So What Do You do About it? The good news is that people can change. It is sometimes difficult to make changes but far from impossible. The best way to change a way of reacting is by not fighting it. Yes, did read that correctly. People do not learn well under pressure, and particularly when one is trying to master a developmental skill, harsh emotions such as impatience, self-recrimination and anger activate fear and fight or flight mechanisms. Once those parts of the brain are activated, survival is more important than growth. We must treat ourselves as we should treat others, and in fact, how we treat ourselves is often a reflection of how we treat others. If someone yells at you or criticizes you, your response is more often to double down, get defensive or even offensive, instead of apologizing or engaging in self reflection. Again this is due to the fight or flight mechanism that is being activated. enced rigid parenting. A person with a compassionate Ego often experienced compassion. There are other more difficult permutations. Such as a person whom experienced detached, inconsistent, dismissive or chaotic parenting, may have an internally distorted, bizzare and chaotic Ego. Sadly, due to divorce, drug abuse and other assaults on the family unit, many people experienced less than healthy developmental contexts, and in particular, the chaos was internalized in a poorly organized Ego. Yet, there is hope. A person can build Ego strength just as one builds muscle. Through exercise and repetition. The first step is to observe your behavior over time with compassion and curiosity. Do not make any resolutions to change, simple resolve to observe and notice your reactions. Notice the various impulses, thoughts and feelings that come into your head as they compel you into action. In time, automatically, you will begin to develop the capacity to notice the various, often conflicting needs and views, and weigh and measure them before you act. These acts of patience and self-compassion become transformative and also will affect the way you relate and treat others. In time, your ability to calmly reflect and appreciate different internal viewpoints will lead others around you to do the same. In ever widening concentric circles, a ripple effect will spread to people around you. With some luck, there will be be peace on earth and everyone will hold hands and sing Kumbaya. Well, okay, that probably will not happen. However, this kind of internal self-respect and listening to self can impact the people you love in a most positive manner. One interesting idea that I have seen recently is to wear your best clothing on Monday. We all have our favorites that are either newer, fancier or simply feel better on our bodies. Save it for Monday. Now you can look forward to looking great on Monday morning (and I also recommend giving yourself a head start on Monday morning by putting out your clothing the night before). I’m not certain that planning to wear a nice shirt or new pair of socks will expunge the anxiety, but it can’t hurt to be ready to look your best. This is an idea that children should be able to relate to easily. MAKE A MIDWEEK “FUN-DAY” One of the common analogies used to describe the anxiety felt before the workweek is that of a swimmer challenged to swim an entire length of a pool in one breath. The catch? The pool is endless. On Sunday night, it can feel like you have to take one deep breath and dive in and not come up for air until Friday, when the week has ended. You then have 48 short hours to recover until you have to do it all over again. Imagine the fear. Imagine the anxiety. What if we threw a lifeline, for a swimmer, a station where he can stop and breathe, or for us in the real world, a special dinner, outing or activity on either Tuesday or Wednesday night? It does not have to be expensive, lavish or even take too long. It just needs to break up the mundanity of the week and give both us and our children something to look forward to. “Yes, Sunday night may be tough, but we can’t wait for Tuesday’s (insert your favorite Tuesday activity here)!” These are just a few of many of self-help tactics. I stress again that anyone who feels the need for additional assistance should certainly reach out to a professional. It is a shame that with all the curveballs life throws us, we sometimes struggle just to mentally prepare ourselves for work and school. Having a job or going to school should be part of the solution of helping us address life’s issues, not an additional burden. But the Sunday Scaries are a fact of life, so the best thing we can we can do for ourselves and our children is to find ways to deal with the pressure and anxiety. I would love to know what works for you. In the meantime, I have to take a deep breath. I have a full week of work ahead! Disclaimer: All information and resources in this article are based on the opinions of the author unless otherwise noted. All information is intended for readers to enjoy. Ultimately, readers should make their own health decisions after consulting with their health care providers. charged a fee because the driver's time is valuable. If the Uber driver's time is valuable, then so is the time of a doctor who has spent years and thousands of dollars in training." What is really cool about Slingshot is that it is not restricted to typical medical care. For example, they offer alternatives to Western medicine, such as acupuncture and hypnotism. They have also expanded to include wellness. On their website you can book a spin class or a personal trainer, and the best part is that you choose how much you are going to pay. Slingshot Health has been accepting bids for less than a year, and they are growing at an incredible rate. They currently have over 500 providers in Manhattan, with over 100 specialties and over 1,000 services. A recent partnership with Hackensack Hospital has expanded their provider base to include Northern New Jersey, adding over 6,500 providers to their current roster. Dr. David H. Berman went to Chicago Medical School. After getting married, he came to New York to complete his internship and residency at Lenox Hill Hospital. Following his residency, he moved to Pittsburgh to attend the University of Pittsburgh where he completed his fellowship in liver transplantation. At that time, the University of Pittsburgh was the only medical center doing liver transplants in the world. Shortly thereafter, Dr. Berman returned to New York City and opened his own private medical practice. He has since built his practice into a multi-specialty group including a few other doctors. Dr. Berman and his wife Debbie are the happy parents of four children and currently have two beautiful grandchildren. A man is holding a corpse standing in the middle of a pool. She looks familiar. I’ve seen her before, but who is she? My daughter is in her stroller sleeping. Why don’t I see her? All I hear is my husband shouting. uly in Miami Beach. My family and I were on vacation after a long year. School, work, the birth of my fourth child: we needed some time to relax. The day was planned with a reservation to enjoy wave-running and the beach, but G-d planned better. One of the wave-runners broke down and the worker never showed up, so our appointment was delayed. After enjoying our time at the beach, we began to head back to our apartment so that my husband could finish his workday before the stock market closed. Using his bionic hearing, Jonathan turned to me and said “Sweetheart, I think there’s a problem. I’m going to run ahead.” We arrived to see my daughter Gali’s blue body held in a strange man’s arms. Jonathan immediately switched to EMT mode and rushed over screaming, “I’m her father, I’m a medic! Let me help.” It was the most haunting scene. I still close my eyes and see my daughter’s still, blue body, cyanotic, eyes open, without a pulse, with her fingertips completely purple. While my husband performed CPR, I started wheeling and dealing with G-d. I observed Torah and mitzvoth (commandments) my whole life. I grew up in a supremely spiritual, traditional, G-d-fearing, Tehillim-reading, kosher-keeping, mikvah-loving family, but on the outside we were not as religious as on the inside. On the inside we were #shtark, on the outside we were #modern. I knew I was meant to keep more on the outside, such as covering my hair as many Orthodox married women do, but I didn’t because my hair was a very integral part of my look. Being a Persian with blonde hair and green eyes was my identity, and it was very difficult for me to give that up. I had struggled with years of infertility and five miscarriages before my first child was born and I was not ready to return this one. A specific verse of Tehillim/ Psalms kept flashing in my mind. “‫אתי ְבכָ ל לֵ ב עֲ נֵ נִ י ה‬ ִ ‫ָק ָר‬ ‫ ֻח ֶקיָך ֶאצ ָֹרה‬.” I have called with my whole heart; answer me Lord, I will keep your statutes” (Psalms 119:145). I looked down and saw that I was clearly not serving G-d His way. I was doing it my way, which was the wrong way, the convenient way. After talking with G-d, and watching my husband perform CPR on Gali, we decided that today, July 26, 2010 (Tu b’Av on the Hebrew calendar), would be the day we would bridge the gap between my outside and my inside. I looked around and saw a blue pashmina shawl. I reached over for the shawl, raised my arm and screamed “Shehecheyanu Vkiyimanu Vhigianu Lazman Hazeh, Thank you G-d for sustaining me and enabling me to reach this moment.” My decision was not necessarily conditional on His return of my daughter to me, rather I knew that I owed this to G-d and I hadn’t been willing to give it to Him, but now was the time. My husband looked at me and immediately understood what I had taken upon myself. While I began to wrap my hair, he stopped administering CPR and stormed the heavens with his own private prayer. He said that his wife will not be the only one to give something to G-d. “For 20 years I volunteered and didn’t ask for anything in return. I am cashing it all in,” and he promised 20 more years of volunteering as an EMT with Hatzalah. The moment I stuck that last strand of hair into the shawl and covered my shoulders with a towel, Jonathan felt Gali’s neck and screamed, “I got a pulse! I got a pulse!” 100 times. After four minutes without oxygen, my daughter was alive again. and living through a nightmare, it was time to take care of my next priority. When Gali was born, she had a terrible case of sleep apnea. She had ginormous tonsils and would get strep throat every single month. My doctor kept telling me that she needed to have her tonsils removed since these issues were inhibiting her growth. I was eight months pregnant at the time and felt I could not currently handle having my daughter go through surgery. I fought with them, back and forth begging them to let me wait until after the summer. While they continued to tell me it was negligent, I convinced them that since we would be in Florida, Gali would avoid strep and it would be fine. I didn’t understand. They had said there is nothing scientific that would warrant a connection between the two things. He explained that when the anesthesiologist tried to intubate Gali for surgery, her tonsils locked up and he wasn’t able to stick anything down her throat. For two years, her poor quality tonsils would close her throat and not allow anything to enter. Not air, not water, nothing. As a result of her tonsils constricting, her body had trained itself to require very low levels of oxygen. Had she not been able to handle the low blood-oxygen levels, her brain would have panicked looking for air while she was underwater, and she would have drowned. Upon our return, we asked the doctors if her tonsils affected her experience in Florida at all, but they were adamant that there is no scientific backing to say that her tonsils and drowning had any connection. Mid-surgery the , the doctor came out of the operating room looking white as a ghost. I was terrified. Dr. Ditkoff turned to me and told me that had I listened to him and removed Gali’s tonsils when he had advised, there is no way that she would have survived drowning. publicizing the miracle that G-d performed for my family. years to build enough bulletproof faith in G-d to say that I would not have changed one thing that happened that year, because too much light has come from my darkness. Eight and a half years later, we have put wigs on the heads of over 14,000 women. help in any way we can! An ounce of prevention is worth a pound of cure. Whenever we discuss emergencies, especially household emergencies, prevention is the key word that comes up. We try to make our homes as safe as possible, reducing the chance of adults, children or infants sustaining injuries. Unfortunately as much as we try, accidents still do happen. One of the more common emergencies that we tend to see prior to a holiday is burns. As we spend lots of time in the kitchen preparing multiple meals for large groups of people, there is a greater chance of burns and minor cuts and bleeds. There are a few different categories of burns, but the most common one that we tend to see in the kitchen is thermal burns, which you can get from hot water, hot soup or liquid, as well as from contact with hot pots and pans. Burns are categorized in three different levels: first degree, second degree and third degree, with first degree being the least serious. Third degree burns are actually the least painful, but they are the most dangerous due to the damage caused and the risk of infection. Depending on the severity and location of the burn, third degree burns often require hospitalization. appears as redness and is usually superficial on just the outermost layer of the skin. It can usually be treated with cold water and heals on its own. also appears as redness but is deeper into the skin. It usually produces closed blisters that if ruptured, may cause infection. is described as a bullseye of dead skin, surrounded by a more painful second or first-degree burned perimeter. You've been burned NOW WHAT? Madison Programs is a premiere training program located in New York. Our certiďŹ ed instructors are available to train your personnel on-site at your location. Our instructors have traveled throughout the United States, and even as far away as London! SAVES AD LIVES ? O D O T T A H W W O N K U O Y D L U O W Schedule a course in your school, workplace or neighborhood. Make sure your and your loved ones know how to keep each other safe. Chimichurri Marinade 1 shallot, finely chopped 1 Fresno chile or red jalapeño, finely chopped 3–4 garlic cloves, thinly sliced or finely chopped 1/2 cup red wine vinegar 1 tsp. kosher salt 1/2 cup finely chopped cilantro 1/4 cup finely chopped flat-leaf parsley 2 Tbsp. finely chopped oregano 3/4 cup extra-virgin olive oil 3 Tbsp soy sauce OPTIONAL SUBSTITUTE: Instead of making your own marinade you can use Ta'amti Chimichurri which is our favorite and you can purchase this at just about any kosher grocery. 1. In a medium bowl, whisk together all the Chimichurri Marinade ingredients. 2. Rub the mixture all over your London Broil. 3. Let sit at room temperature for an hour or refrigerate up to 12 hours. 4. Preheat broiler. 5. Place steak on a sheet pan. Broil 12 to 15 minutes, until top is charred. 6. Flip and broil 12 to 15 minutes more, until internal temperature reaches 125° for medium rare. 7. Let rest 10 minutes before carving. 8. Slice about 1/4 inch thick. Slicing Directions: First, find the direction of the grain (which way the muscle fibers are aligned), then slice across the grain rather than parallel with it. Chicken: Mix all the ingredients (except the chicken). Marinate the chicken in the ingredients for 1-12 hours. Heat a grill pan or oven and cook 3-5 minutes on each side. Quinoa: Rinse quinoa in a fine mesh sieve until water runs clear. Drain and transfer to a medium pot. Add 2 cups of water with 2 teaspoons of salt and bring to a boil. Cover, reduce heat to medium/low and simmer until water is absorbed, 15 to 20 minutes. Set aside off the heat for 5 minutes; uncover and fluff with a fork. Heirloom Tomato: 1: Rinse the tomato and pat dry. Step 2: Place the tomato stem-side up. Use a serrated knife to cut the tomato in half from top to bottom, cutting through the core Place the tomato cut-side up and slice again lengthwise into wedges. Avocado: To slice the avocado, take the tip of your chef â&#x20AC;&#x2122;s knife and slice into the avocado half, making vertical cuts as thick or thin as you like. Tip: Avocado browns quickly. A squeeze of fresh lime juice will keep it green! Put all the above in a bowl, garnish with a lime wedge for color and added tang to your taste! *Due at signing; 1st month payment, Bank Fee, DMV Fee & applicable taxes. Residency restrictions may apply. Pricing available for well qualified lessees. Not responsible for typographical errors. Subject to inventory availability. Boro Park Urgent Care is the newest Kāmin Health emergency care facility. Serving all surrounding neighborhoods, this office is centrally located on the corner of 13th Avenue and 45th Street, where it occupies the first floor of the newly completed superstructure, enhancing its accessibility. Open until at least midnight daily, the facility is operated to aid the community—whenever they need us. With in-house X-ray and laboratory capabilities, BPUC is your one quick stop for urgent care needs. At BPUC, a warm smile and friendly greeting will be offered to you as you enjoy our beautiful facility with its free beverage station offering water, tea and gourmet coffee. Kāmin Health’s Crown Heights location is a 4,500 square foot facility located on the corner of Kingston and Lefferts Avenues. It occupies the ground floor of 555 Lefferts Avenue, a large multi-family dwelling, and is surrounded by several new residential developments that will accommodate the influx into one of the fastest gentrifying neighborhoods in New York City. Crown Heights is a neighborhood that sees a constant flow of visitors from around the globe who will be able to access their medical needs at CHUC. In addition to traditional urgent care offerings, our center will soon offer several specialty services that are not adequately available in this densely populated neighborhood—stay tuned for more news on this! d e t a v Ele Lives From infants to seniors, from siblings to parents, OHEL Bais Ezra provides a lifetime of comprehensive person-centered services to those with intellectual disabilities. • Manhattan Respite • Medicaid Service Coordination • Motzei Shabbos Programs • Non-Medicaid Service Coordination • Outreach Programs NEW!• Queens Overnight Respite • Respite (Brooklyn, Queens & Manhattan) • School Holiday Programs • Shabbatons • Free Clinical Evaluations • Intensive Behavioral Services • Shabbos B’nos NEW! Opened in March 2014, Kāmin Health’s flagship center is situated on a major thoroughfare at 186-06 Union Turnpike, on the border of Fresh Meadows and Jamaica Estates. Just 100 feet from a 24hour Rite-Aid Pharmacy and ensconced among many busy local stores, this highly visible location attracts many people. Students and faculty from St. John’s University, located just a half-mile away, are among those who utilize UMUC’s services. Since opening, our facility has won the praise of many local officials, communal leaders and residents. UMUC has been voted “Best Urgent Care Center in Queens” by local community members. Williamsburg Urgent Care is the newest urgent care facility in the Williamsburg area. Serving all surrounding neighborhoods, this centrally located facility is on Lee Avenue, where it occupies the second floor of a newly completed superstructure. WUC is open daily until midnight so it can best serve the community. With one quick stop, all your urgent needs can be taken care of, including X-rays and laboratory services. Come in for friendly and fast service and enjoy a complementary drink of water, tea or gourmet coffee from the beverage station. HEALTH FUN FACTS 1 Eyelashes last about 150 days. 2 Your fingernails grow four times as fast as your toenails. 3 The smallest bone in your body is in your ears. 4 A sneeze blows air out of your nose at 100 miles per hour. 5 Your eyeballs are actually part of your brain. The first player draws a straight line between two adjacent dots. You can not draw diagonal lines. The second player draws a line between two dots. Play continues in this manner until eventually a player can close a box. After closing a box, player puts his initial inside to â&#x20AC;&#x153;claimâ&#x20AC;? it. He then gets another turn. If he is able to close an additional box, he gets yet another turn, until he can not close any more boxes. Play then continues with the other player.